In hot summer days, choosing the right cooling option is essential for many of us. Our common intention to maintain the right balance between our energy bill and comfort level compels many of us to explore various cooling options out there. There are mainly two types of effective cooling options available today – air coolers and air conditioners. Both cooling options have some edge over another. Many of us often get perplexed to determine the suitable cooling option between an evaporative air cooler vs air conditioner. In this article, we are going to explore the various features of these two cooling options and conduct a comparative analysis to assist you in making up your mind. Air coolers, also known as evaporative coolers or swamp coolers, cool the air with a basic principle. Hot air is blown near the cool water to decrease the temperature. Evaporative coolers need water to cool down the room temperature and you can add ice cubes for a better cooling effect. 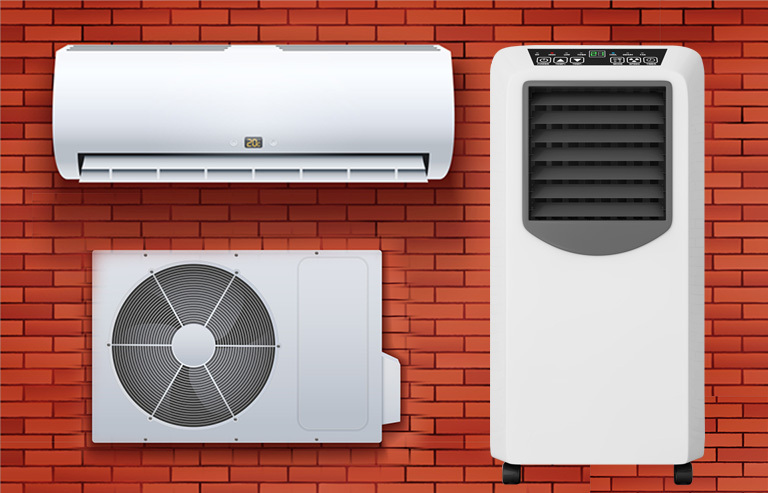 The main difference between evaporative cooler vs air conditioner is that air coolers rely on a motor and air conditioners rely on compressors to provide cool air. That’s why air coolers are more energy efficient than air conditioners. Air cooling system is a natural phenomenon which is simulated in an evaporative air cooler or swamp cooler. When we pass by a river or pond or any water body, we can feel a soothing breeze of air. This occurs due to the heat absorbing nature of water when dry air passes by. The air gets cooled when the temperature and vapor pressure of water attempt to equalize with those of air. The heat of the dry air is dissipated in that way and the air circulates on its own. In evaporative air coolers, the same thing happens. Dry air passes by the water tank of the cooler. Then the air cools down and a fan blows the air to the room to boost the circulation. The air cooling system has many distinguished features that make it unique in comparison to other cooling systems. Evaporative air coolers or swamp coolers rely on motors and water to provide cool air. Since the motors consume very little electricity and water is widely available in our environment, the operating cost of air coolers is usually very less when compared to air conditioners. They come in portable sizes and unlike air conditioners, they don’t require any ventilation system. Since air coolers use water to cool down the room temperature, they add moistures to the room. An air cooler can decrease the room temperatures up to 20 degrees Fahrenheit. Air conditioning is the most prevalent cooling option around the world. It is suitable in any climate. Air conditioners rely on refrigerants, a chemical compound which can absorb heat. Air conditioners circulate and reuse the refrigerant with the help of compressors to cool down any insulated space. There are many types of air conditioners specifically designed for every possible situation and climate. They are perfect for both household and commercial spaces. The air conditioning process is a complex one that demands a separate blog. 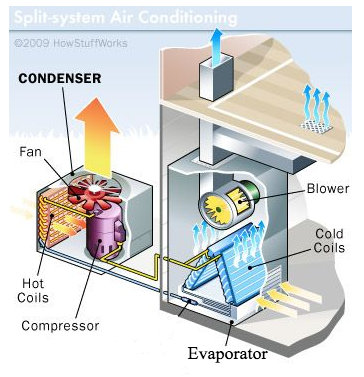 However, in short, air conditioners have two main units to complete the cooling process. They are the evaporative unit and the condenser unit. 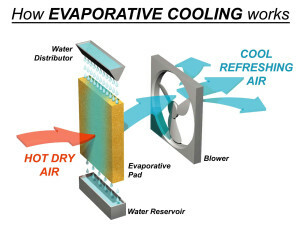 The evaporative unit draws the hot air from the room and absorbs the heat from them through an evaporator coil. The evaporator coil soaks the heat with the help of refrigerant. The heated refrigerant is then transferred to the condenser unit to cool down. At first, the condenser unit heats the refrigerant even more with the help of a compressor. Because of this extra heat, the heat dissipation process of refrigerants by the condenser unit fastens up. The condenser unit pushes the dissipated heat outside with the help of a fan and sends the cooled refrigerant back again to the evaporative unit. Surely, the air conditioning process is far more complex and this is merely the gist of it. To understand the process in detail you can read our other blog on this topic. Air conditioners are more effective than any other cooling options. They mainly rely on refrigerants and compressor to cool down the temperature. That is why the energy consumption of an air conditioner is far greater than any other cooling option. In an estimation, air conditioning is responsible for around 10% to 18% energy bill of a household. Air conditioners have many health benefits. However, since the refrigerant chemical being used in the air conditioning system are CFCs, HCFCs or HFCS gas, Air conditioners have a negative impact on our environment. Both air coolers and air conditioners have different advantages and disadvantages. To choose the most suitable cooling option, a comprehensive comparative analysis is needed. Air coolers are far energy efficient than air conditioners. Air coolers mere rely on motors to provide cool air. On the other hand, air conditioners rely on compressors, which requires a lot of electric energy. In comparison, swamp coolers require 75% less electricity than air conditioners. Air coolers require electricity and water to provide cool air. You have to fill the water tank on a daily basis. On the other hand, air conditioners only require electricity and you just have to clean the air filter on a monthly basis. However, despite air conditioners only require electricity, the operating cost is 3 times larger than that of air coolers. Since air coolers use water for the cooling process, they release moisture in the air. That is why air coolers are most effective in dry climates. But in humid climates, air coolers lose their effectiveness. On the contrary, air conditioners have a dehumidifier effect in the air. Nonetheless, air conditioners are effective and suitable in every climate. Air conditioners have a negative effect on our environment. The refrigerant, which is used for soaking the heat is a mixture of either CFCs or HCFCs or HFCs gas. As per the recommendation of the “Montreal Protocol”, the US government already banned CFCs and HCFCs refrigerants. HFCs is safer than these two types but not 100% safe. On the other hand, air coolers simply use motors and water to provide cool air and don’t have any negative effect on our environment. Most of the air coolers available on the market are portable air coolers. They are easily movable to any rooms as you want. On the other hand, not every air conditioners are portable. Although there are portable air conditioners, they still need a venting kit to be attached for draining the hot air through the window. The air conditioning system requires properly insulated spaces to provide effective cooling. It cycles the same air by constantly absorbing heat from it. On the other hand, air coolers don’t require insulated spaces to provide effective cooling. It uses the fresh air from outside to cool the room. The debate on air cooler vs air conditioner depends on your preference, climate, and energy requirements. Since air coolers are ineffective in humid climates, you should avoid buying them if you are living in a humid area though they are a great option for saving energy, environmental integrity, and flexibility. On the other hand, if you are focused on effective cooling all year round, you should pick an air conditioner.